Today begins the Year of Faith 2012-2013, on the 20th anniversary of the promulgation of the Catechism of the Catholic Church, and the 50th anniversary (“quinquagenary”) of the opening of the Second Vatican Ecumenical Council. To mankind, oppressed by so many difficulties, the Church says, as Peter said to the poor who begged alms from him: “I have neither gold nor silver, but what I have I give you; in the name of Jesus Christ of Nazareth, rise and walk” (Acts 3:6). In other words, the Church does not offer to the men of today riches that pass, nor does she promise them merely earthly happiness. But she distributes to them the goods of divine grace which, raising men to the dignity of sons of God, are the most efficacious safeguards and aids toward a more human life. She opens the fountain of her life-giving doctrine which allows men, enlightened by the light of Christ, to understand well what they really are, what their lofty dignity and their purpose are, and, finally, through her children, she spreads everywhere the fullness of Christian charity, than which nothing is more effective in eradicating the seeds of discord, nothing more efficacious in promoting concord, just peace, and the brotherly unity of all. 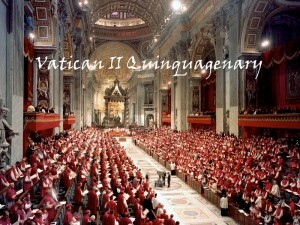 They are also at the EWTN website: Second Vatican Council: the 16 Documents. And here is a plan for reading all of them over the course of a year: The Vatican II Challenge. Starting today, you can follow along at The Great Grace. As I read out loud, I found myself shocked. These papers didn’t say anything like what I expected them to say. I didn’t disagree with what they said in the least. And I certainly didn’t see how they could have been used, in the way that they’ve been used.